It looks like Greece is close to clinching the deal with troika for additional bailout funding. Reuters: - "The authorities and staff teams agreed on most of the core measures needed to restore the momentum of reform and pave the way for the completion of the review," the so-called troika of IMF, European Commission and European Central Bank lenders said. They said talks on the remaining sticking points, which according to Greek officials centre on job market reforms, will continue with the aim of reaching a deal in the coming days. Financing issues will also be discussed, they added. Inspectors from the troika were due to leave Athens on Wednesday to brief leaders at a two-day European Union summit starting on Thursday, where Greece's future will loom large in the background despite not being the focus of talks. At this stage many view Greece's fiscal situation as untenable. Credit Suisse expects the debt to GDP ratio to stand at 175% by the end of this year, which is 12% above IMF's projection from earlier this year. Financially isolated (with massive liquidity problems - see discussion) and squeezed by tough austerity measures, the nation will have a difficult time growing into its debt (to levels that would make the current debt levels sustainable). Many now think that another government debt restructuring should be a serious consideration. The IMF agrees, but the European Commission and the ECB have opposed it. This restructuring needs to take place soon in order for Greece to get on a sustainable growth path. Sadly the European leadership tends to delay the inevitable for too long - until the politicians and bureaucrats are staring at another crisis. The question now is if the debt levels were adjusted down, can Greece realistically be expected to get back on a growth path. After all the economy has been contracting since 2008. But something interesting is starting to happen in Greece. With the Eurozone as a whole slowing significantly, Greek output growth no longer looks as bad relative to the rest of the euro area. 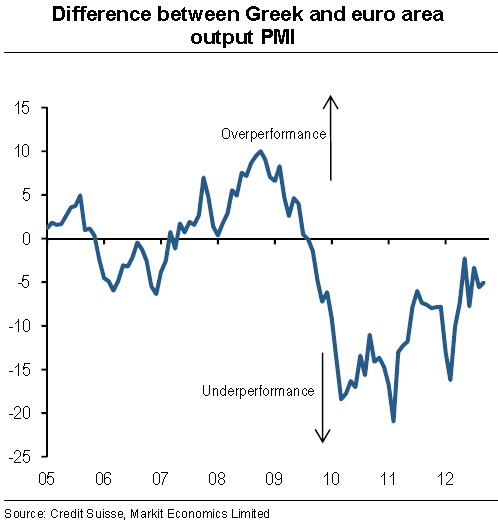 The relative PMI chart below demonstrates that trend. Is the PMI effect all due to the Eurozone slowdown or is there some stabilization in Greece? As is the case with other Eurozone periphery nations (see discussion), Greek trade deficit has been cut dramatically. 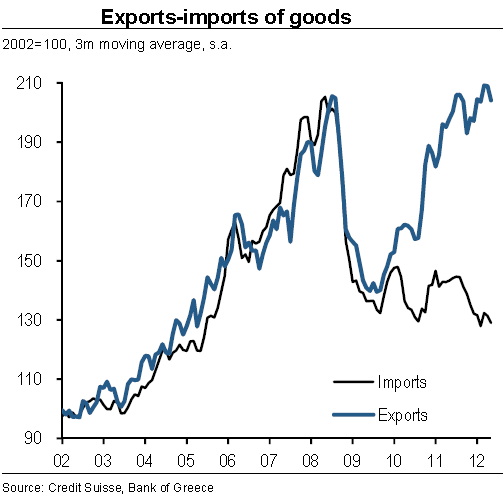 Greece is now running roughly a balanced goods and services trade account. It has managed a strong surplus of trade in goods alone. These improvements in trade balances are starting to be reflected in industrial production as demand for goods from abroad picks up (a bit like Ireland, though nowhere near the progress the Irish have made). Wages have fallen dramatically (a drop of 8.3% in the first half of 2012), which should improve competitiveness (clearly productivity has a long way to go - see discussion). And Greek inflation has consistently clocked below that of the Eurozone. Furthermore, in spite of the central government running roughly a 2% budget deficit (better than the target), the so-called "general government" (central government + local governments + social security funds + other public entities) according to CS is actually running a balanced budget and is expected to have a surplus next year. On the back of some of this data as well as the ECB-induced recent "stability" in the Eurozone (which has reduced near-term chances of Greece exiting the union), Greek government yields have declined 2-3% in the past month alone. Now we can return to our earlier question of whether Greece can get back on a sustainable growth path after a second round of debt restructuring. The answer, which may surprise some, is definitely yes. The data suggests that the nation is turning the corner. Willem Buiter/FT: - With the Greek general government expected to run a small primary surplus next year, there is hope of an economic rebirth, provided Greece gets serious about structural reform of its labour markets, its professions, its bloated public sector, its tax administration and public expenditure management. Troika needs to make the restructuring (which may involve lowering rates, pushing out maturities, and possibly haircutting principal) a priority to assure that the situation no longer looks hopeless. Because currently at 175% debt to GDP ratio, it certainly does. If Greece is to stay in the union, restructuring of public debt is quite urgent and in the long run could be extremely constructive for Greece.